Michael (Mike) Bishop Elbeck, retired Denver Police Officer was born October 15, 1951 in Pueblo, Colorado. He went home unexpectedly to be with his Lord and Savior on Saturday November 17, 2018. He is survived by his wife of 30 years, Debbie (Kelly) Elbeck, his son Joshua (Danielle) Rosetta, daughters Avery (Ben) Harrison, Crystal (Andrew) Beelner and Jacee Elbeck. Grandchildren Maddyson, Allyson, Riley, Morgann, Ryan, Roman, Corrine, and Quinn. His siblings Gayle Young, Warren Elbeck, Cindy Henderson, John Elbeck III, Steven Elbeck, Jeff Wagoner, Olga Elbeck and Brian Elbeck. Preceded in death by his parents Billie Ruth (Scott) Wagoner and John Elbeck Jr., Sister Jacque Wilson and Brother Phillip Elbeck. Also survived by many nieces, nephews, cousins, friends, and his three fur babies Bolt, Cooper, and Bella. 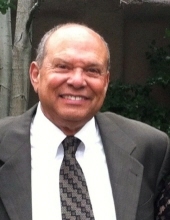 Mike attended St. Mary’s Elementary School in Pueblo, CO until the family moved to Denver where he attended Denver Public Schools graduating from George Washington High School in 1970. Attending University of Colorado at Boulder for a year he quickly achieved his dream to become a police officer in 1975, serving with the Denver Police Department for 31 years before retiring on February 16, 2006. After retirement Mike stayed busy working with Hal’s Sports as a timer for runs and stair climbs. He also worked with JFR & Associates, Inc. Michael loved to travel with his wife, taking yearly trips to Puerto Vallarta with close friends Rick and Barb Firman. Known as Poppy, Poppa, and Grandpa, Mike loved hanging out with his grandchildren attending school events, sports events and the ever popular sleepovers at Mike and Debbie’s house. He himself being such a kid at heart, he always made sure to go over the top every year in decorating every spot of the house with Christmas lights and decorations. He was known throughout his neighborhood for the best Christmas decorations! Mike’s Celebration of Life will be held on Tuesday, November 27, 2018 at 11:00 a.m. at PPA (Police Protective Association) Event Center at 2105 Decatur St. Denver, 80211. To send flowers or a remembrance gift to the family of Michael Bishop Elbeck, please visit our Tribute Store. "Email Address" would like to share the life celebration of Michael Bishop Elbeck. Click on the "link" to go to share a favorite memory or leave a condolence message for the family.